Last summer I fell in love with a recipe in the August issue of Bon Appétit for a Peach and Pecan Upside-Down Cake. And oh, was it good. I made it for the 4th of July and then a couple of days later baked another one that I transported to a family reunion. The peaches baked in brown sugar and butter were perfectly tender and the pecans added a great nutty taste as well as the a bit of crunch. It was a cake that made you want to turn on your oven when it was 100 degrees outside; a cake that lacked pretension, but was still far from ordinary. Here in the Carolinas this year’s peach harvest is predicted to be one of the best in years and I know that upside down peach and pecan cake is in my future. But recently I took a little detour. Sweet cherries were on sale at the grocery store for $2.00 a pound this week and I might have lost a little self-control. I’ve noshed on cherries for breakfast, lunch and dinner and I’ve barely made a dent in the bag. In other words, I had no choice: I had to make a cherry dessert. 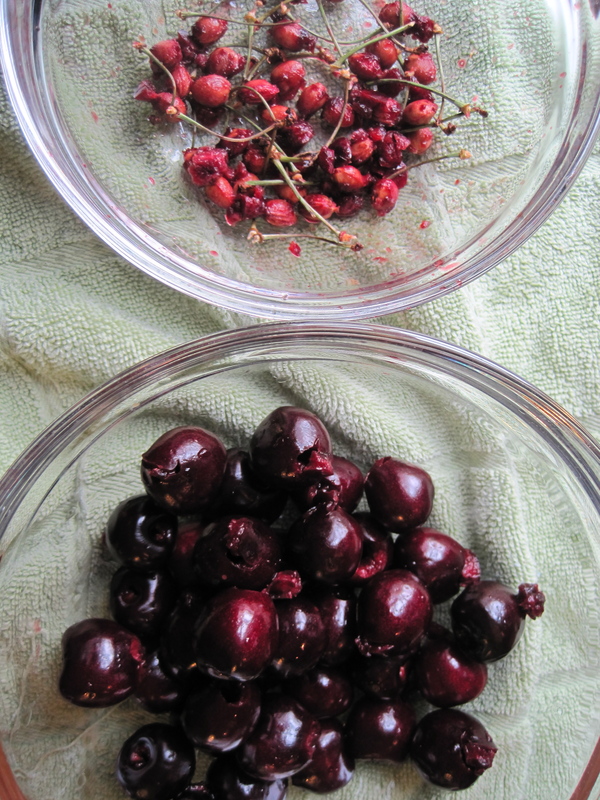 As anyone who has looked up cherries in a cookbook knows it’s the tart/sour cherries that get all the hoopla. Which is fine except for the fact that sour cherries are quite elusive and I had a bag of sweet ones. So I decided to experiment a little. I took last summer’s recipe for upside-down peach and pecan cake and substituted cherries and almonds for the peaches and pecans. The result: heaven in cake form. It’s that tasty. 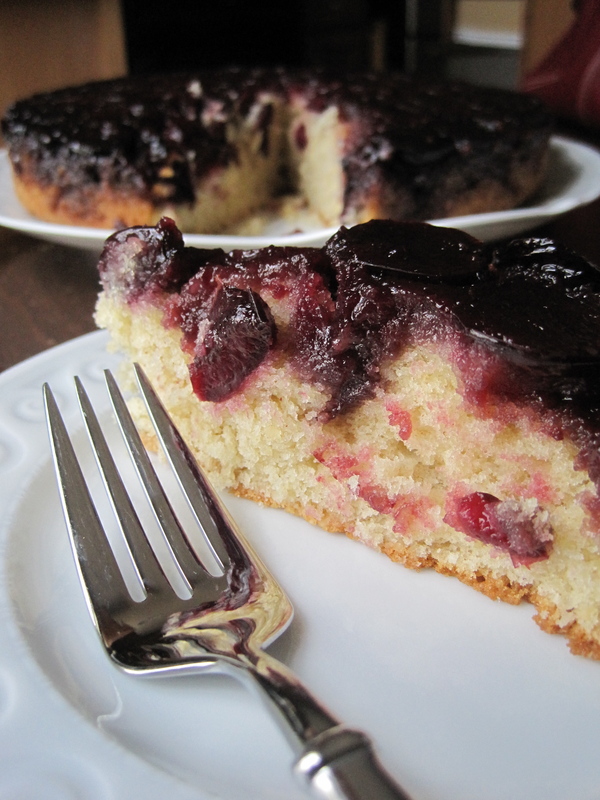 When baked, the cherries turn jam-like with rich, lush flavors. The cake is moist, not-too-sweet and lightly spiced. It’s summer perfection and with a scoop of vanilla ice cream…well, let’s just say it’s got the cherry on top. Adapted from the recipe for “Peach and Pecan Upside-Down Cake” in the August 2009 issue of Bon Appétit. 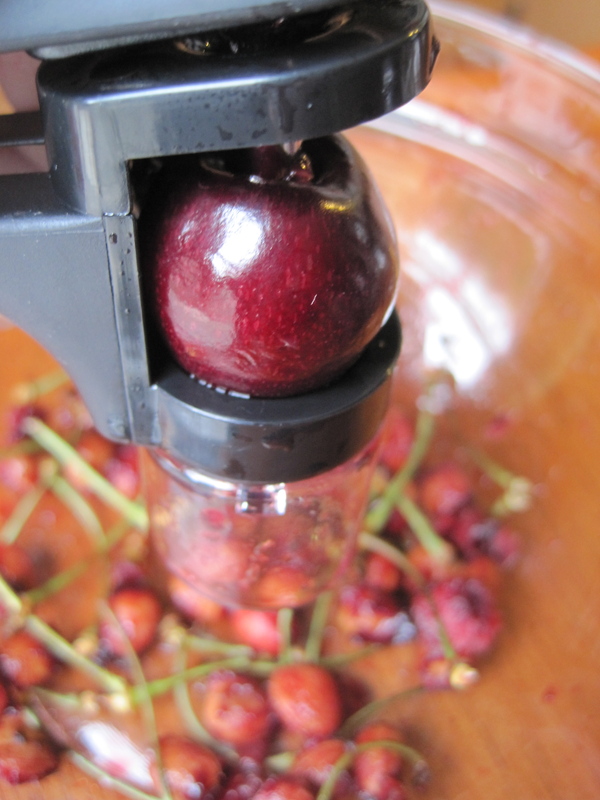 I’m not one to be seduced by kitchen gadgets, but I did buy a cherry pitter prior to making this recipe. I have no regrets. It makes quick work of what would be a laborious task. Place a rack in the center of the oven and preheat the oven to 350 degrees. 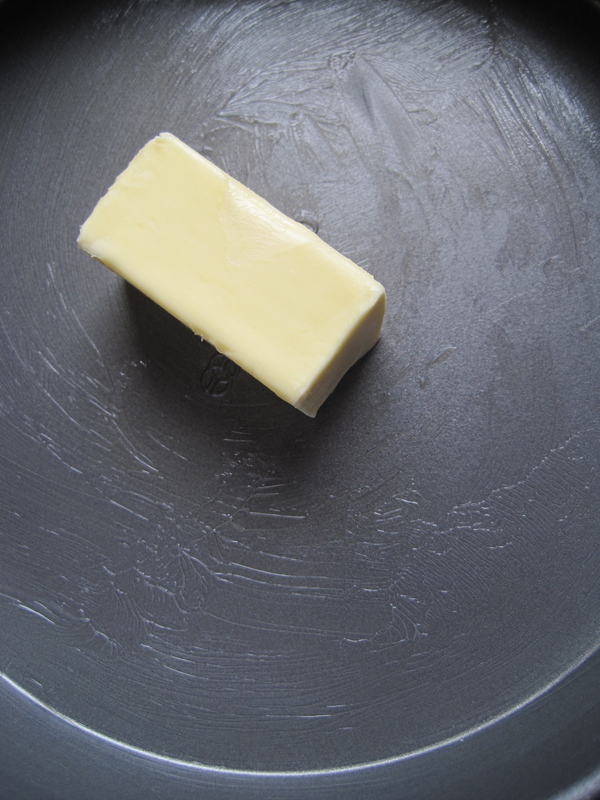 Grease a 9-inch diameter cake pan with 2-inch sides with butter. Add the 4 tablespoons of butter to the cake pan. Melt the butter in the cake pan over medium-low heat. 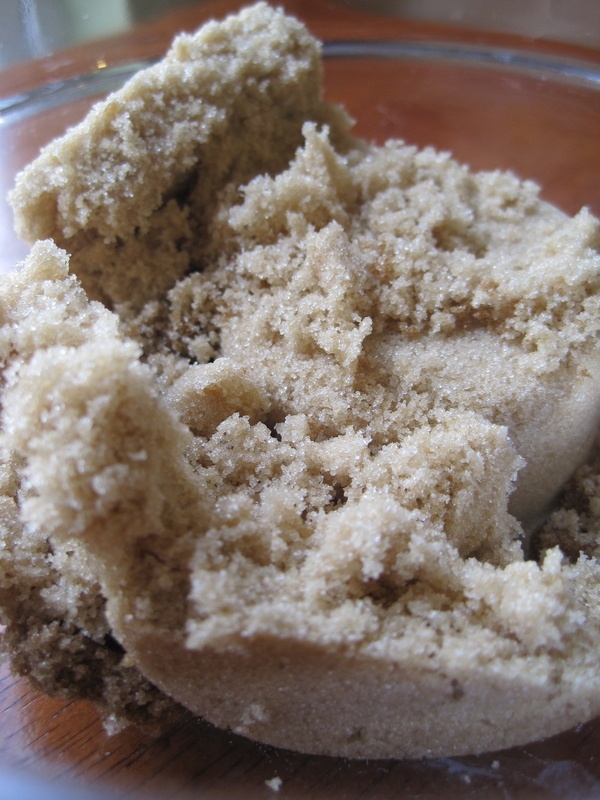 When the butter has melted, stir in the light brown sugar until it has been incorporated. Remove the cake pan from the heat and evenly spread the butter-brown sugar mixture around the bottom of the pan. 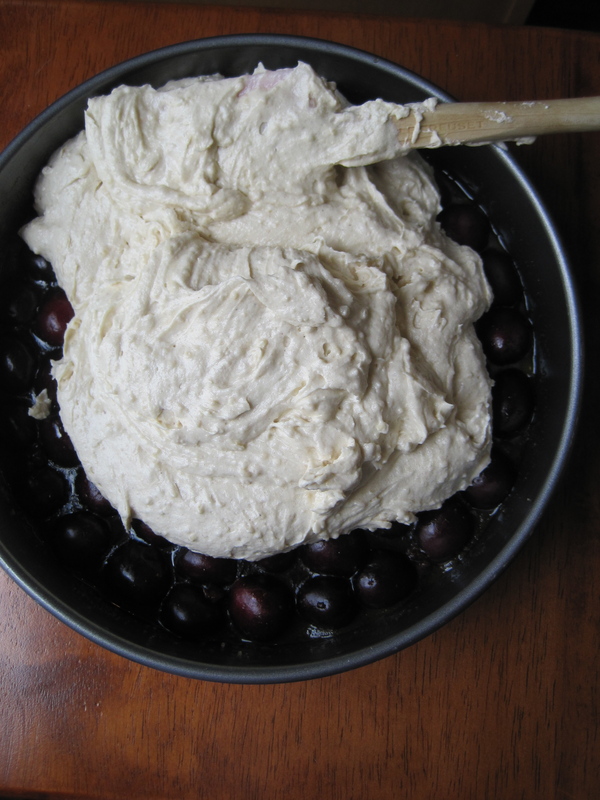 Add the cherries, halved side down, to the cake pan. 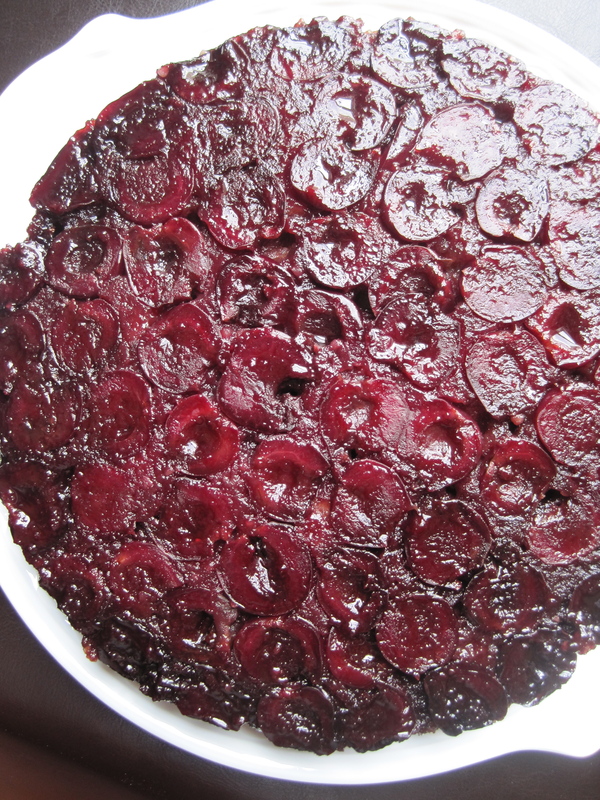 The cherry halves should be touching each other and should cover the bottom of the cake pan. Set aside. 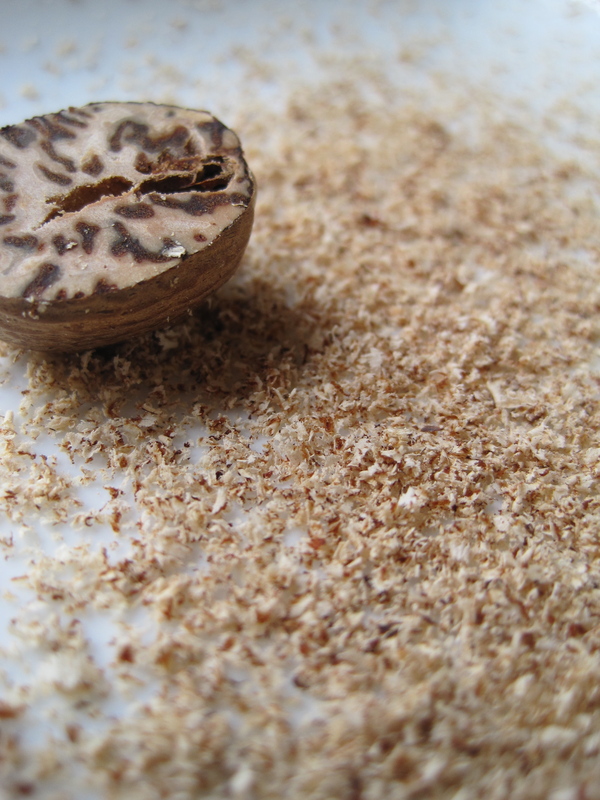 In a small food processor or blender, finely grind the almonds. In a large bowl, whisk together the ground almonds, the all purpose flour, the baking powder, the freshly grated nutmeg, cinnamon, and salt. Set aside. Using an electric mixer, beat the sugar and butter until light and fluffy. In a small bowl, whisk together the eggs and vanilla extract. Slowly add the eggs to the sugar and butter mixture and beat until well combined. Add the flour mixture in 3 additions; alternating with the milk in two additions. After each addition, beat until just blended. 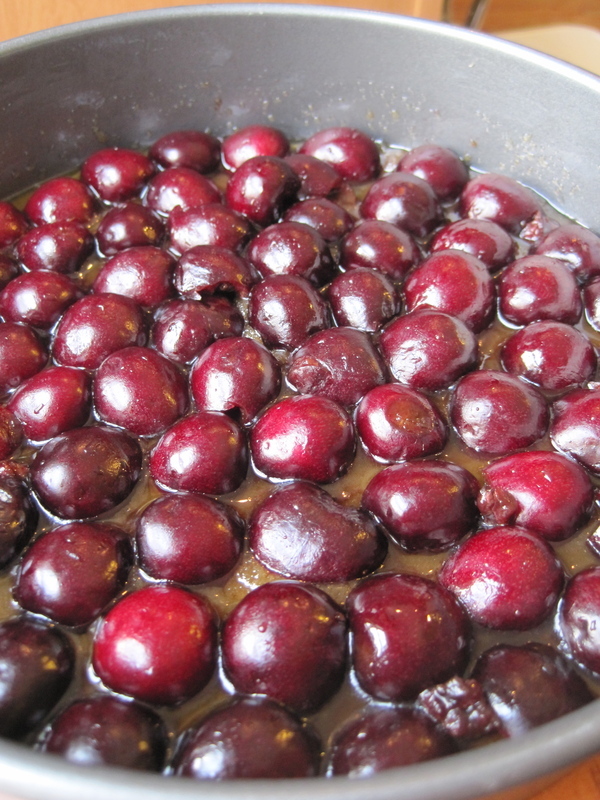 Scrape the batter on top of the cherries in the cake pan and use a rubber spatula to spread the batter evenly. Place on the center rack in the oven and bake for 45 to 50 minutes (or until a toothpick inserted in the center comes out clean). Remove from the oven and set on a wire rack to cool for 25 minutes. Run a knife around the edge of the cake to loosen it. 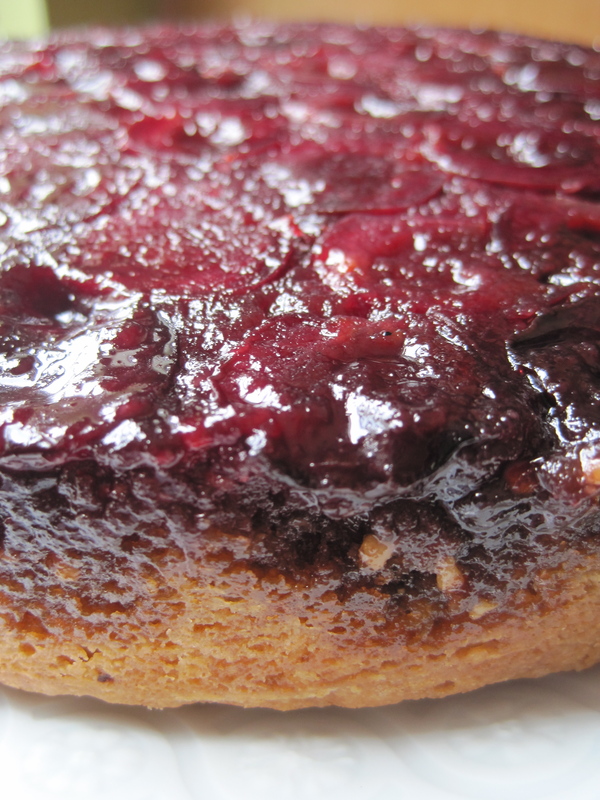 Place a large plate or serving platter on top of the cake pan. Hold the serving platter and cake pan together and carefully invert the cake pan so that it is on top of the serving platter. Carefully remove the cake pan. Serve the cake while still warm or at room temperature. If desired, garnish with a scoop of vanilla ice cream. mmmmmmm…..sounds and looks delicious! Written so well, I can almost taste it! I like your description, “heaven and cake form”, ahah, and everyone will demolish it with gusto ;] It sounds delicious. I once made a cherry pie where I manually pitted the cherries with a knife. Needless to say, it took a while, ahah. 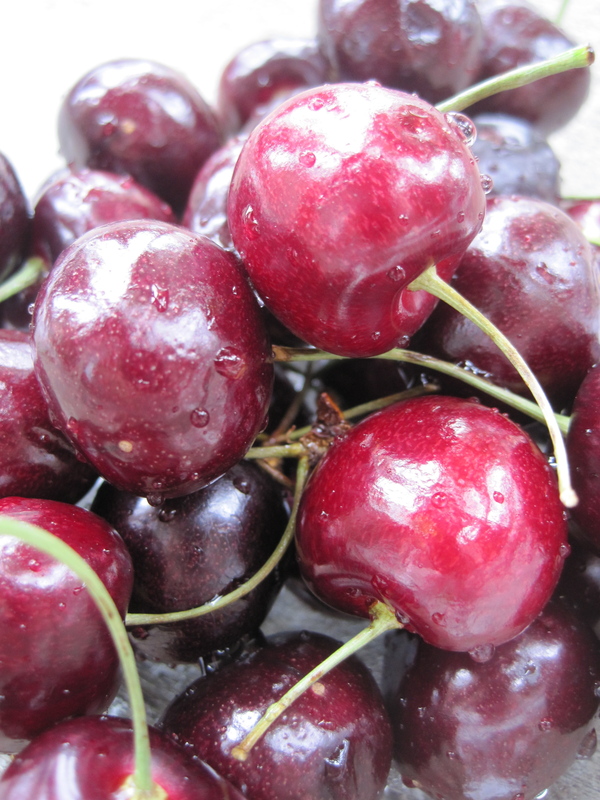 The rainier cherries should work great – certainly give us an update though.